What is The Virtual High School? The Virtual High School (VHS) is a non-profit organization poised to increase educational opportunities for high school students worldwide. Students access learning content with peers and teachers in an online, collaborative learning environment. The Virtual High School offers hundreds of courses across several disciplines, including honors and AP, and is accredited by both Middle States Association Commission on Elementary and Secondary Schools (MSA-CESS), and AdvancED. Your Virtual High School courses are like any other in that you will have readings, assignments, discussions, homework, projects, and grades. You will interact with teachers and students through the online VHS portal through discussion boards (chat rooms), email, blogs, and wikis. Unlike a regular classroom, you will have to manage your work and your interaction independently. 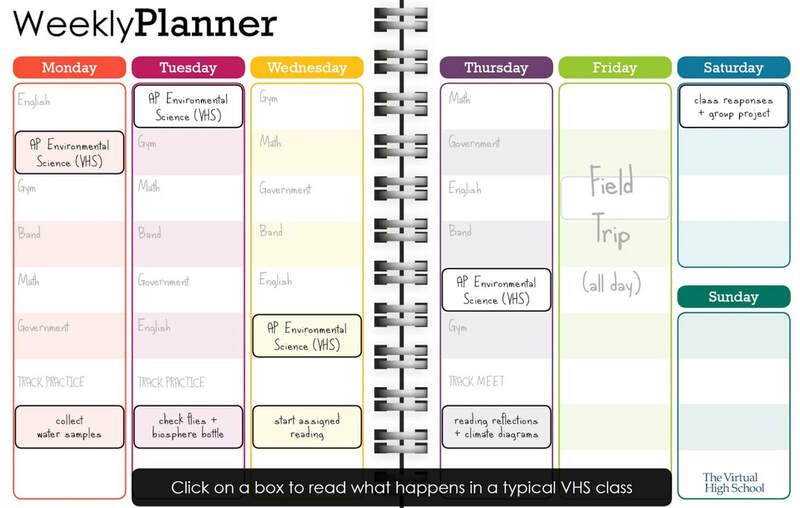 Here are some tips for success in your VHS classroom! What Should You Do in Class? When logging into your class for the first time each week, review the Weekly Overview. Use the table to create a plan for your work. When you begin class each day, log into your account and check the News section for reminders and updates from your VHS teacher. Pay close attention to due dates! Most assignments are due at the end of the week, but some (e.g., discussions) have mid-week due dates. Check your Private Topic daily to see if you have messages from your VHS teacher! View lectures from your teacher, read your texts, complete assignments, and participate in discussions during your Commerce class period. Complete any unfinished work at home by the end of each week. If you are having trouble accessing your course or understanding what to do, ask your Commerce teacher to assist you. If you are struggling with an assignment or a reading, ask your Commerce teacher for support and advice so you don't fall behind. Stay on track! You need to finish your assignments and discussions by the end of each week. Don't save all the work until the last day! Plan ahead! At the beginning of the week, plan out your assignments and goals on paper (e.g., in a calendar, using a checklist) and track them. Read and post in discussions a few times during each week! Complete assignments in a word processor (e.g., Google Docs), then cut/paste work into the assignment on the VHS platform. This is helpful in case a technical issue creates a problem for posting work. Don’t forget to click “Post” when you upload assignments and check to make sure your files have uploaded before submitting your work. If something isn't working right and your Commerce teacher is not able to help you with a technical problem you are experiencing, you can call VHS support at 978-897-1900 between 8AM and 6PM Monday - Friday. To access your VHS course(s), log into your account on the VHS platform. You will need your username and password.